Born in Ukraine to a Ukrainian mother and a Belarusian father, she worked as a journalist in Minsk, covering the impact of WWII, Chernobyl, the Soviet-Afghan war and the breakup of and fallout from the Soviet Union. She spent the 2000s in political exile from Lukashenko’s regime and moved back to Minsk in 2011. She was a strong candidate against Alice Monro last time, and has won numerous awards for her work internationally, including this May, her second Ryszard Kapuściński Award for the book Second-hand Time: The Demise of the Red (Wo)man (Время second-hand. Kонец красного человека), translated into Polish by Jerzy Czech, and into numerous other languages. 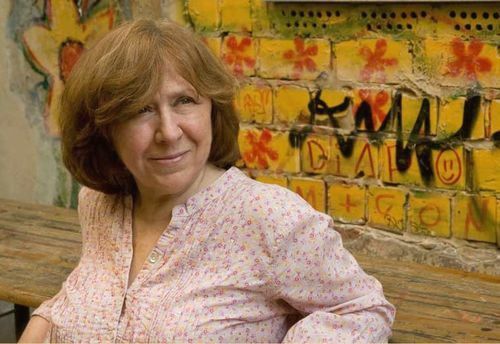 Alexievich enables all sorts of people to speak out. Polyphony is her characteristic feature – she collects a multitude of stories from real people, and brings the voices together. As she says herself on her website: “I tried this and that and finally I chose a genre where human voices speak for themselves. Real people speak in my books… I’m writing a history of human feelings”.